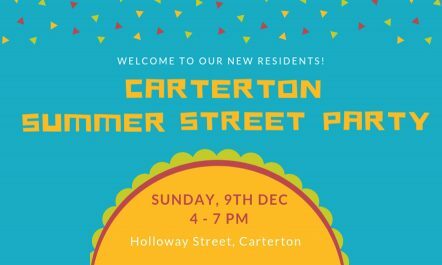 The Carterton Summer Street Party is a chance for the Carterton Community to get together and welcome our newest residents and celebrate summer, our town, and all that makes it wonderful. Holloway Street will be closed to vehicular traffic and there will be food trucks, a live band playing, kids activities and entertainment for the whole family. A cash bar will also be operating inside the Carterton Events Centre foyer. So bring your deck chairs, picnic rugs and bean bags – meet the new members of our community and reconnect with those you already know. This is a free event! Invite your friends, family and next-door neighbours to come along and we’ll see you all there! Follow the Facebook Event for more information and updates.